June 2, 2010 Dan O. In today’s world, Leonardo is being chased around all over the country. However, it’s not by Tom Hanks, just millions upon millions of screaming girls. 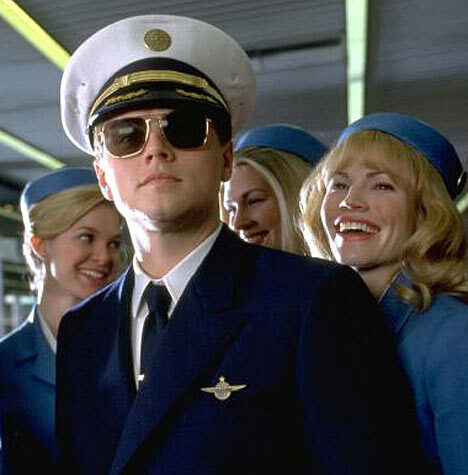 Frank W. Abagnale Jr. (Leonardo DiCaprio) is a cunning con man — posing as a doctor, lawyer and pilot all before turning 21. He’s also a deft forger, and his work attracts the attention of FBI agent Carl Hanratty (Tom Hanks), who makes it his mission to put Frank behind bars. But Frank not only eludes capture, he revels in the pursuit, even taking time to taunt Carl by phone. Steven Spielberg is most known for making viewers bring the kleenex out with movies such as E.T., or Schindler’s List. So it’s kind of a refresher to see when he isn’t trying to make us cry, and is more or less trying to make us have a good time, without pulling our hearts out. Spielberg does something very well in this movie, and that’s totally keep us entertained throughout the whole 141 minutes. The movie is a drama/thriller with little bits of comedy that actually work quite well. Some people will complain about it dragging on too long, however, I think it didn’t drag on enough, and was satisfied with the time it was allowed. It was surely great to see how this character was put into all these situations, but yet seemed to find a way to con his way out of them. The best thing about those situations, is that almost all of it is true. He basically got away with anything, due to his will to charm the best of them. The one thing that really makes this film work is that it focuses on Abagnale Jr., not as being a petty con man, but more of a victim of a lost child-hood, and who is so ashamed of his own parents divorce, creates his own identities, to get away from his “real” one. I think the problem with showing Abagnale Jr. in his later life, early in the film was a mistake, particularly because it seems that the pattern of the story-telling is a bit mixed. I have to say that if there was a film that really started showing audiences that he can really act, this is the film where it all started, for Leonardo DiCaprio. This character could have been so easily hated, and so unlikable, however, DiCaprio somehow makes it like you want to see this guy get away from the cops, and actually never be found forever, even though he is robbing the country dry. There are plenty of moments where DiCaprio just shows his beautiful artistic ability, especially when it comes to him almost breaking his act, and coming clean with what he is doing, overall its just a performance to see. It was also great to see Tom Hanks working again. You know, he does these star-turning roles every once and awhile, however we barely see him get lost in roles, to where we don’t think its him, and these are one of those roles. Hanks is serious, but yet he is so serious, that its actually pretty funny. Must I not forget to mention Christopher Walken is in this! He, as usual, is just perfect, and there is just one scene between him and Hanks actually on-screen, and it is actually very remarkable to see, but its still vintage Walken at its finest. Consensus: This story could have been used so wrong, however Spielberg uses great pace, and great character study to make this film a refreshing film, with even better performances from the cast. Hhaha great line, and it easily could. yeah great film. my favourite spielberg. hanks is great. LOVE this movie. Good review, man. Hhahah wonderful line perfected by the great Hanks. Thanks brah, me too! It’s certain Spielberg’s least sentimental, which is probably why I like it so much. It’s funny, it’s charming without being “charming” and the touching moments emerge naturally, not because of Big Speeches (here’s looking at “Saving Private Ryan”). It is his least sentimental, however, it still is pretty sentimental to a criminal. But is great at what it does and that’s why I love it the most. Great review! I only wish we can see both Leo and Tom Hanks together on screen again. It’s rare that a movie with this fine acting and well-written script could be so much fun, but this one definitely fits the bill. The Hanks/Leo combo was great and they played off each other well. I should’ve read this review before I made my ‘dream male duo’ list 🙂 Great review! It was great especially those scenes where they are together, which is a sight to see. A thoroughly enjoyable Spielberg movie that I have always felt suffered the same fate as The Terminal – better first half than second. But still, hardly a bad movie. Hanks is great, as is DiCaprio. This movie was so thoroughly enjoyable and still is. Hanks and DiCaprio are so good, the story is so fun, and the damn movie is so likable. You nailed this one on the head. Wow, maybe I need to see this again. I only saw it the one time and was not crazy about it at all. I’ll have to give it another shot. Sad that they have to turn this into a Broadway musical too. For shame, legitimate theatre!!! Exactly, damn theater does that all to great movies. Love this too! 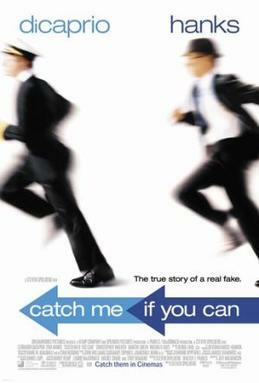 Before this movie, I wasn’t a fan of Leo DiCaprio, but his acting skills in Catch Me If you Can were superb and changed my mind. It turned things around for him. And you’re right it’s very entertaining considering that it’s over 2.5 hours long. Oh yeah, this is one of the first movies that people actually stepped back and said, “damn this kid can sure as hell act”. i‘d have to disagree. dicaprio already proved as a teen that he can act. have you never seen “this boy’s life”, “basketball diaries” or “what’s eating gilbert grape”. he even got nominated for an oscar for that one.